One thing about living in a tent is that you don't have to peek outside to know if it's raining or not. There's a calm wind rustling the fabric above our heads but no tell-tale pitter-patter to signal a dismal day of wet riding. Excellent! Scottish skies are clearing. 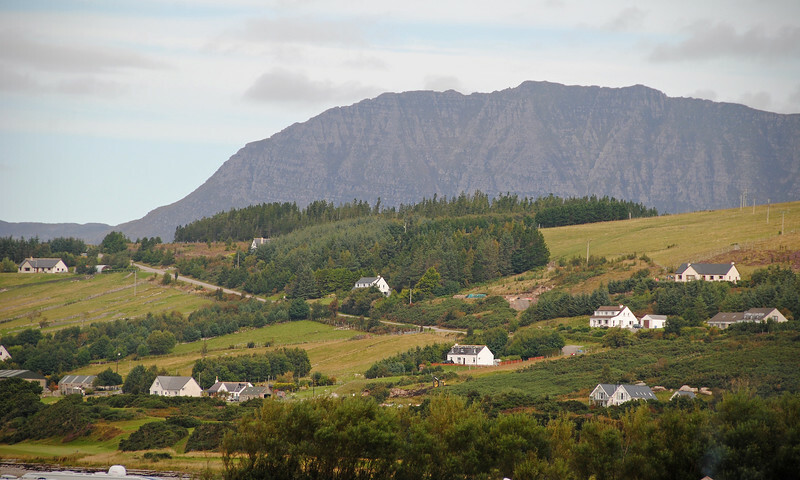 The fingers of land rising up from the inlets that Ullapool is ensconced in are visible against the backdrop of the town. Really nice guys. 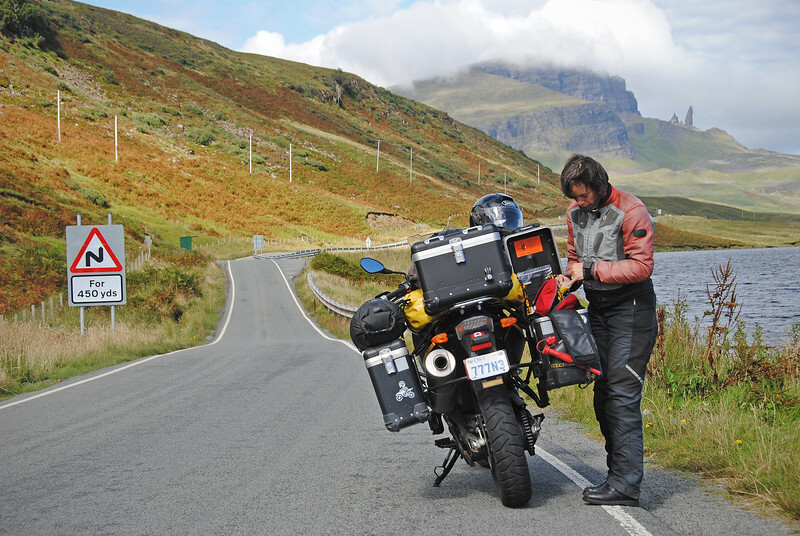 As motorcyclists, you always have something in common to talk about. They were surprised we knew so much about Stuttgart, where they're from. 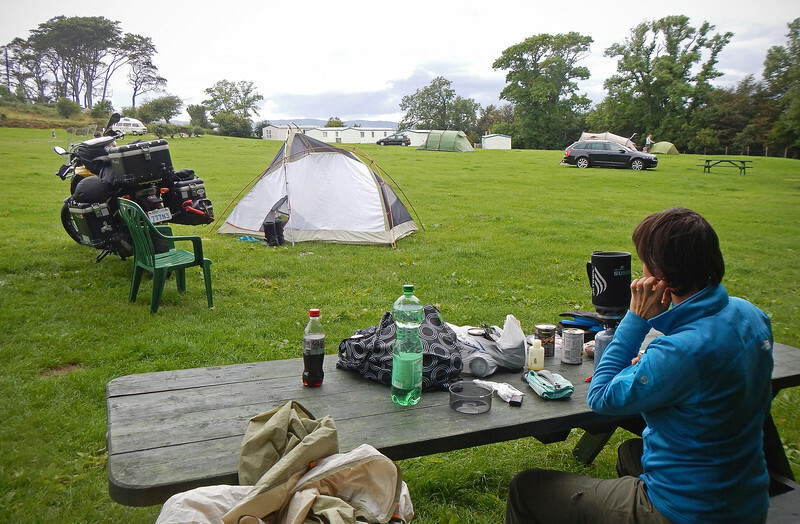 After Joni and Andy pack their bikes up for the long ride and tow back to Germany, we were all alone in the campsite. Taking some time to dry our tent. 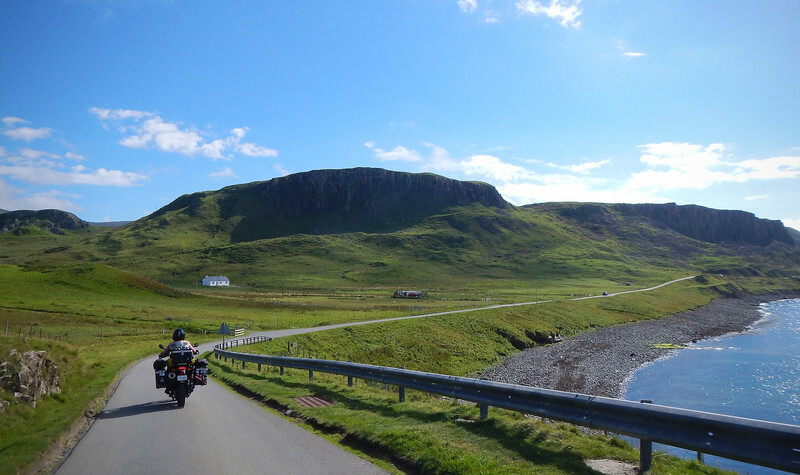 We are continuing down the North Coast 500. 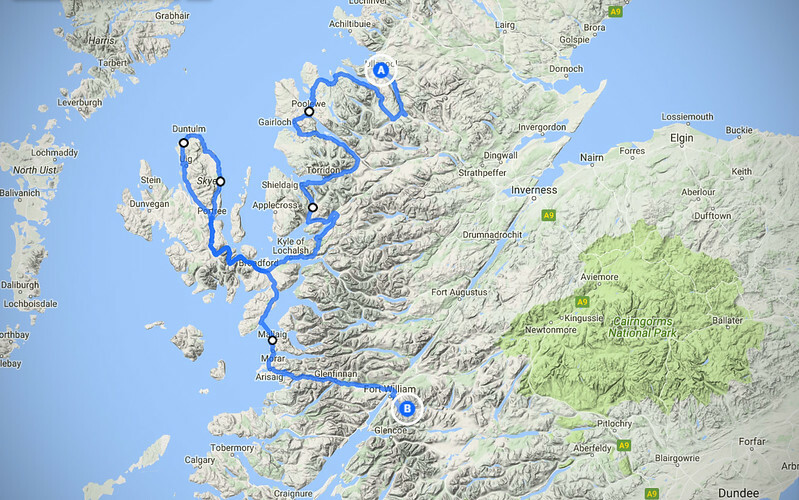 Our route for the day consists of following the fringe of land as it reaches in and out along the west coast. A sign on the side of the road indicates that we are on the Wester Ross Coastal Trail. Wait... what? Wester Ross? Like from Game of Thrones...?!? 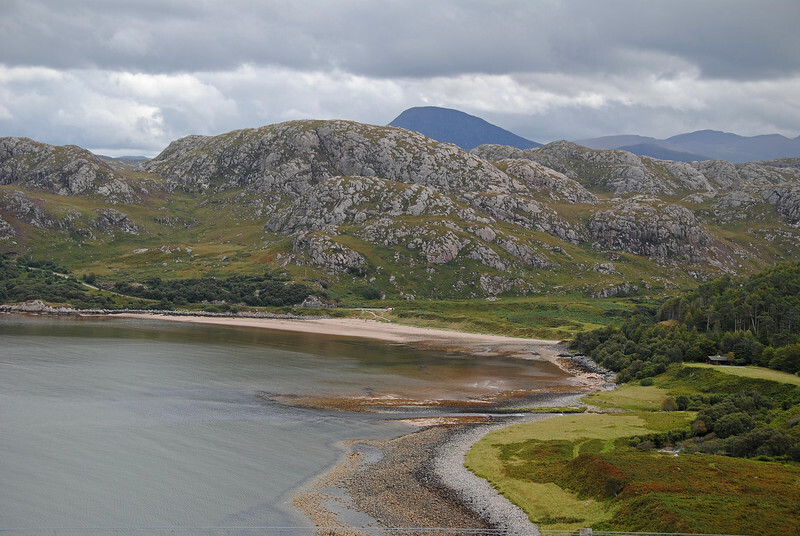 OMG, George Martin totally stole the name of Westeros from the Scottish Highlands! And from riding around the area, I could totally see the series being based up here! When Neda takes off her helmet, one of the guys looks very surprised and exclaims to the rest of the group in the thickest Scottish accent I've ever heard: "It's a woo-min!" It was hilarious! 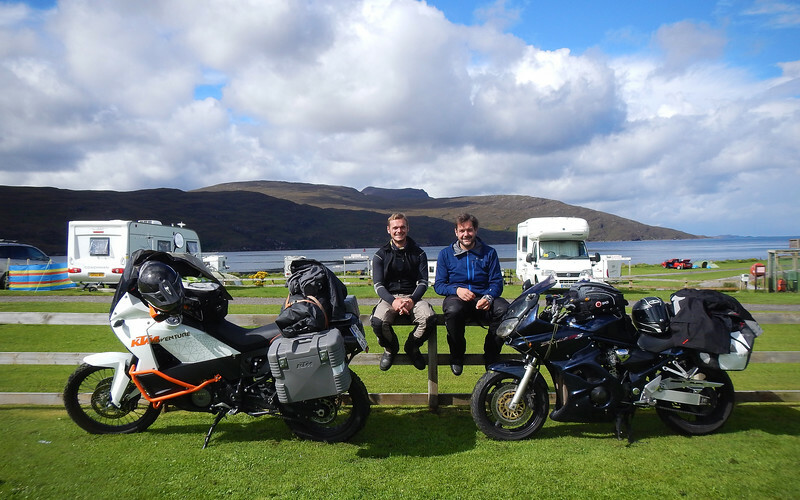 Again, like with most motorcyclists, we have a great time joking around with these Scottish lads. 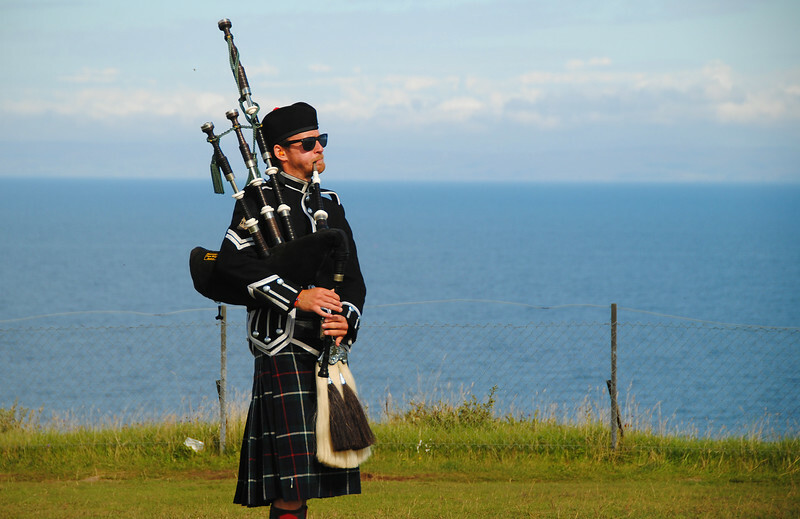 One thing I've noticed when there's a bunch of Scottish guys all hanging out together, *EVERYTHING* is a laugh. They were constantly making jokes and poking fun at each other. So funny! Looking out over Wester Ross. See any dragons, Neda? Does the Loch Ness monster count...? The entire rest of the day, I joke with Neda over the communicator, "It's a woo-min!" HAHA! We leave the main road to explore all these tiny roads that stretch out into the sea and then back inland again. There's no traffic and the tarmac shrinks to a single lane as if in response to the lack of attention it receives. 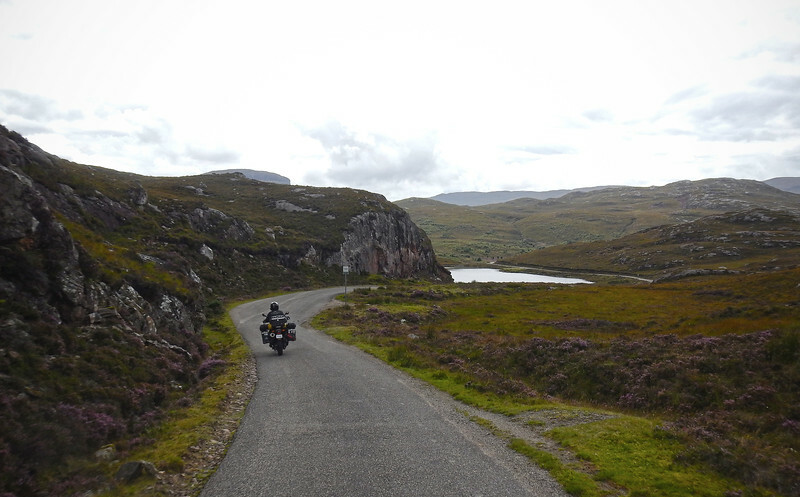 Tons of lochs in the area, and the road keeps winding and turning! The weather's not too bad considering the bad reputation Scotland has for rain. 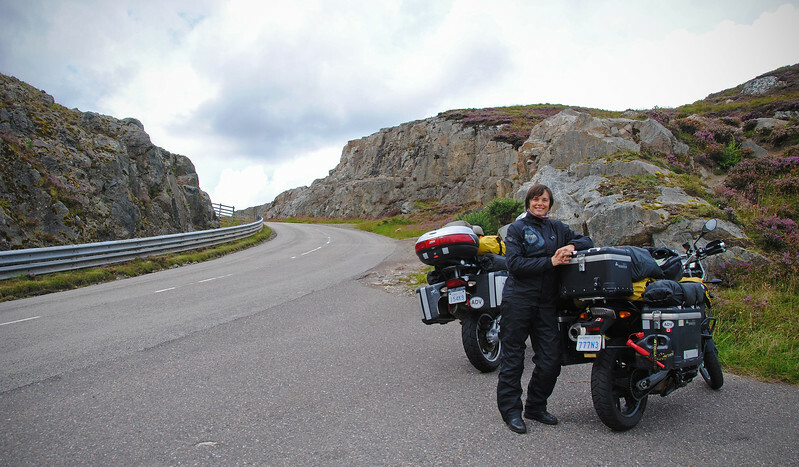 And we're really enjoying having twisty roads and amazing scenery all to ourselves. 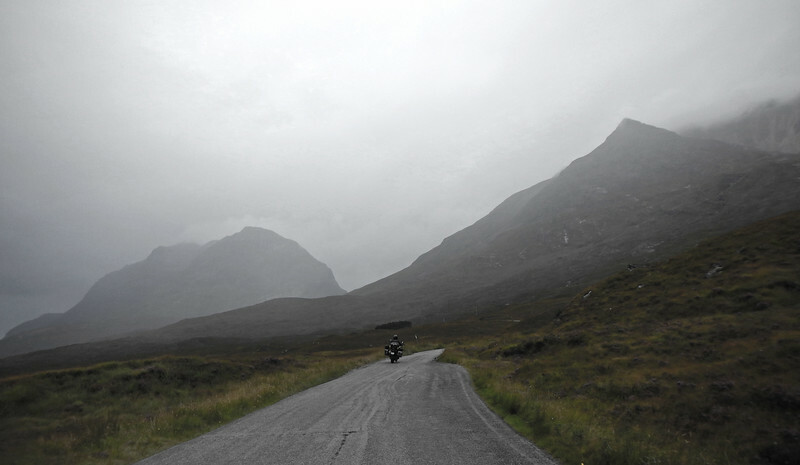 It starts to get a bit more livelier when we reach the next big town of Applecross. 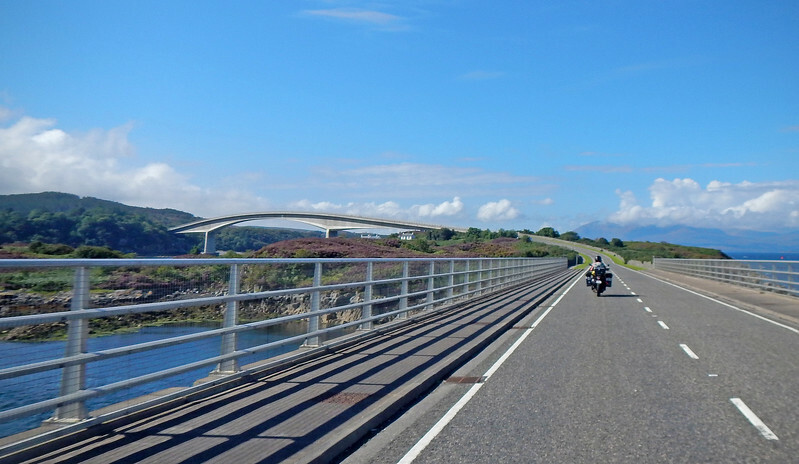 This is another place that's done very well since the North Coast 500 opened. There is a flurry of vacationers and recreational vehicles milling around the stores and campsites in the area. In town, there are lots of pubs and specialty stores, but we've had our fill of pub and restaurant food, so we go looking for a grocery store. 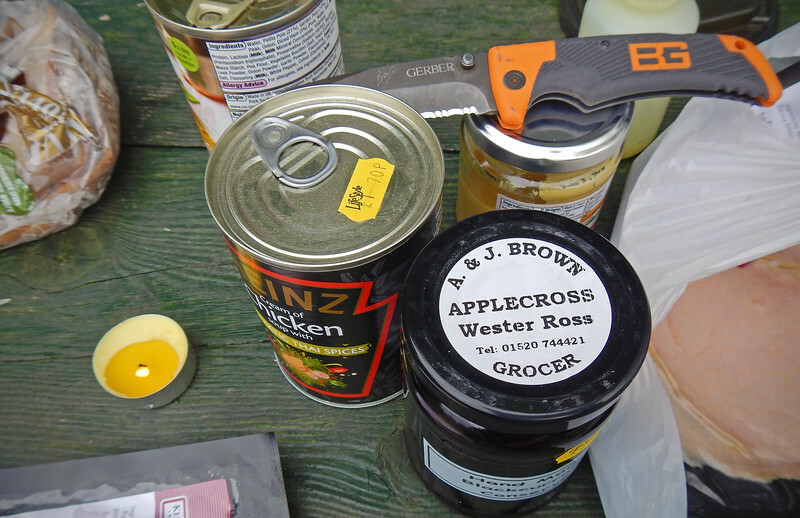 The closest thing is a little shop a few kms outside of town and we stock up on some soups and sandwich stuff. Neda couldn't resist picking up some locally made jam. I suspect she only bought it because it's a Game of Thrones jam. 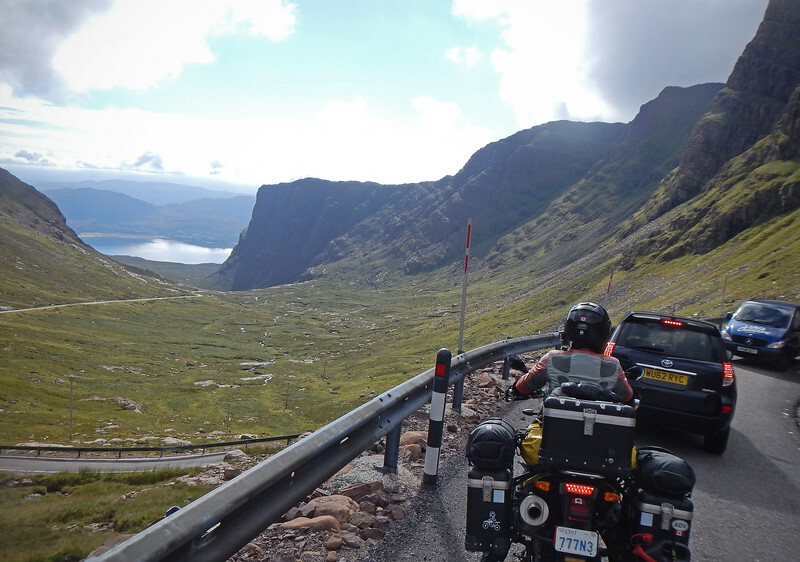 The Applecross Pass is also called Bealach na Bà, which is Gaelic for "Pass of the Cattle". 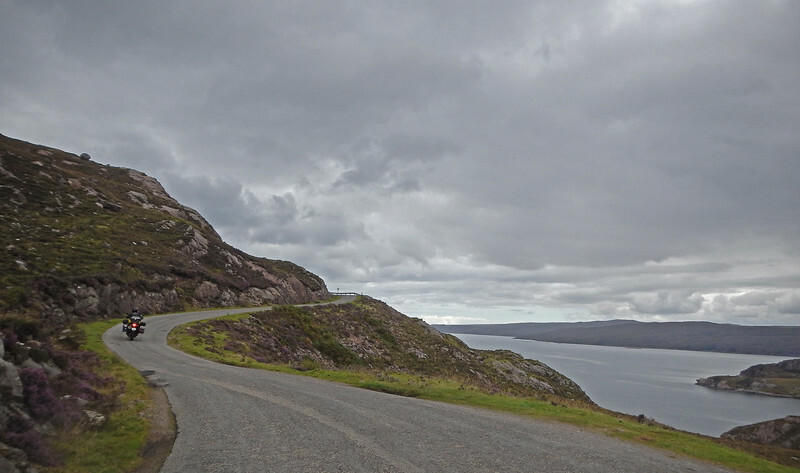 It's one of the highest mountain roads in the UK and boasts stunning views of the mountainside sloping down into Loch Kishorn, its distant waters reflecting the colours of the sky above. 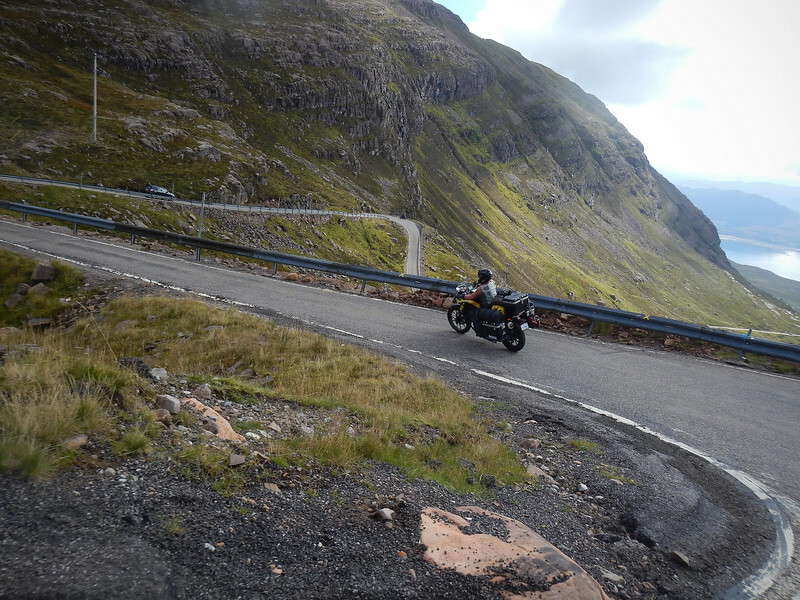 Applecross Pass is only single-lane! Not nearly wide enough for all the tourist traffic! Here, downhill traffic has to give way and back up to the last passing zone. The steep and tight hairpin bends were engineered to mimic the Alpine passes in mainland Europe. However, you won't see any huge tourbuses on this road! Not like the superhighway-wide passes at Stelvio. Traffic in front of us is very polite and pulls over at the next passing zone to let us through. Wheee!!!! 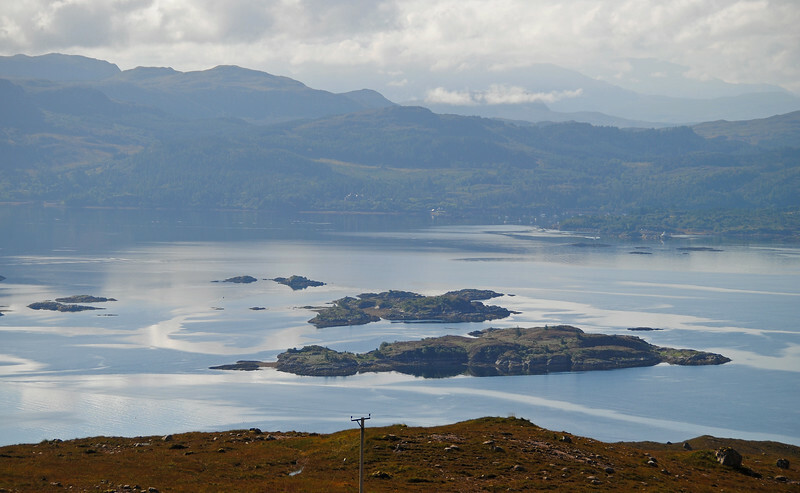 Little islands at Loch Kishorn at the bottom of Applecross Pass - looks like a painting! 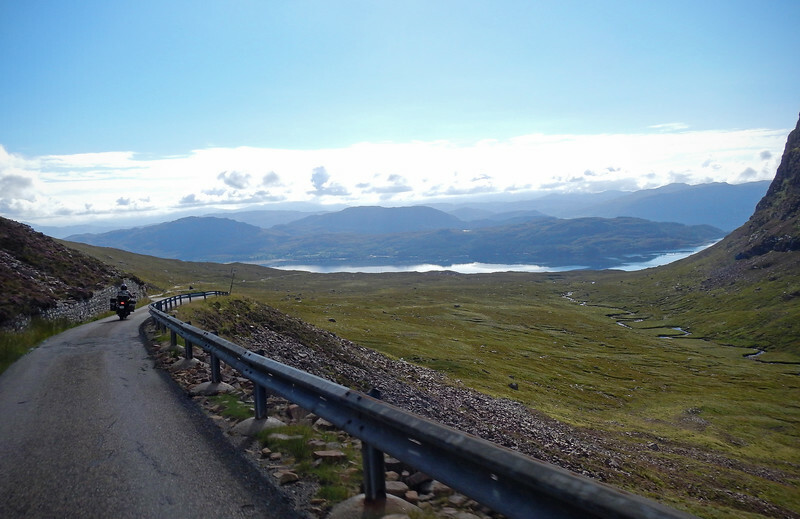 At the bottom of Bealach na Bà, looking back up at the mountains we went through. At its highest point, Applepass Pass is over 2000 feet. 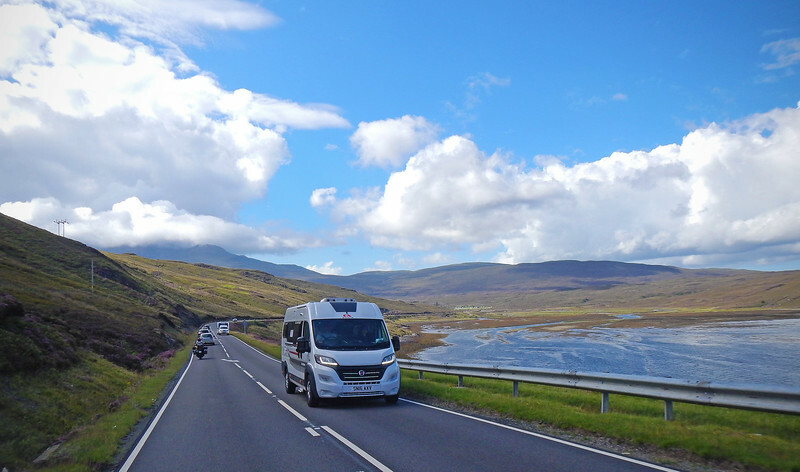 We continue to follow the road as it runs beside and passes by all the lochs along the western coast, smiling at each twist and turn in the road. The day is turning out quite marvelous, the clouds clearing and letting the sun warm our southbound ride. The plan for today is to cross over into the Isle of Skye, tour around a bit and then find a place there to sleep overnight. We heard the scenery there is spectacular! Along the way, we see: Eilean Donan Castle. Wow! 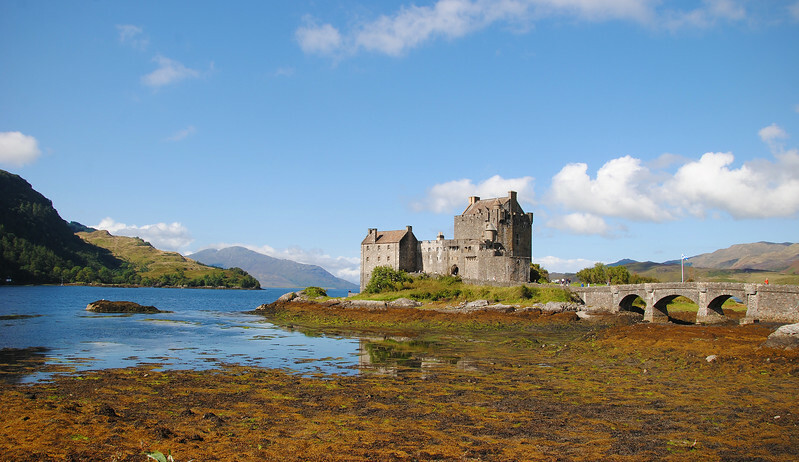 Standing at confluence of three lochs, Eilean Donan Castle is a magnificently restored Scottish castle and is one of the country's most iconic images. 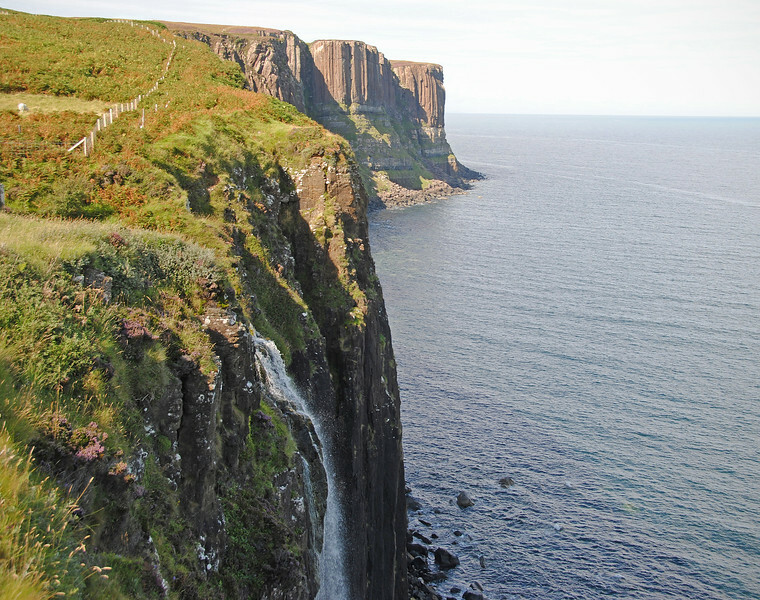 George Martin said that the Iron Islands in the Game of Thrones is modeled after the western isles of Scotland. 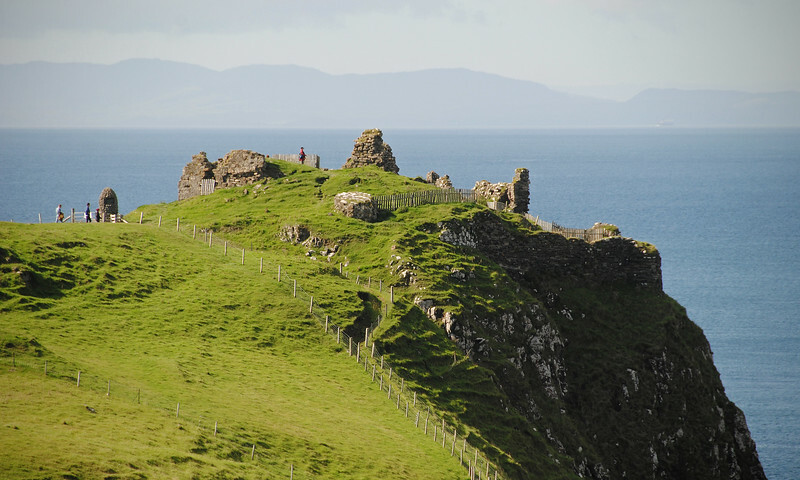 I can totally see this rocky, rain-washed scenery to be the home of Greyjoy Castle. The minute we cross into the Isle of Skye, we are inundated with traffic. 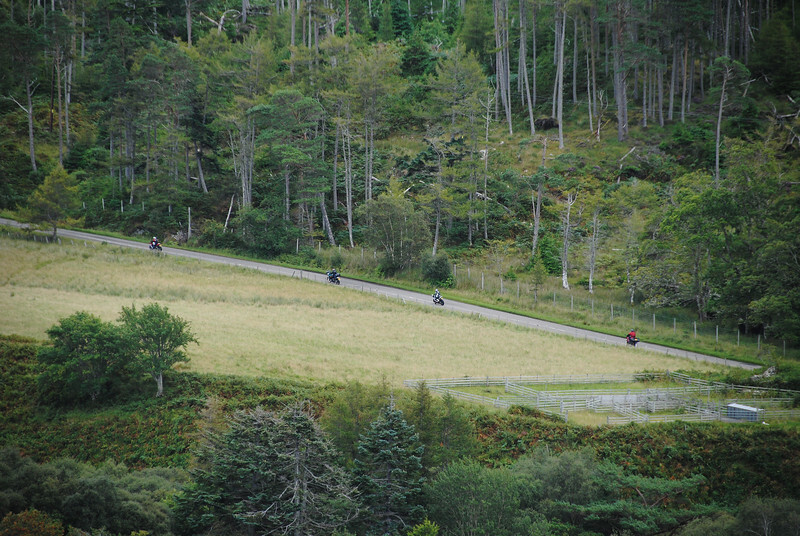 This is probably the busiest area that we've ridden in the Scottish Highlands. Hard to enjoy the scenery when you're staring at the back bumper of an RV the entire way. 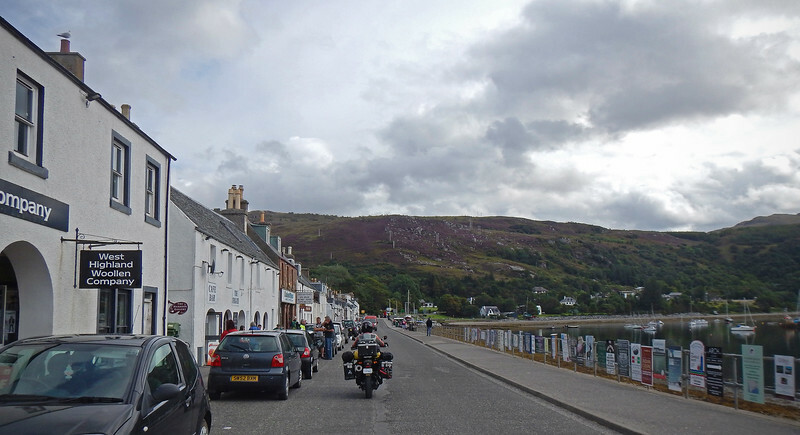 We stop for lunch at the very touristy town of Portree for an expensive hamburger. Tourbuses dump tourists of all nationalities out into the street in search of souvenirs before they re-embark on their guided tour of the Isle of Skye. 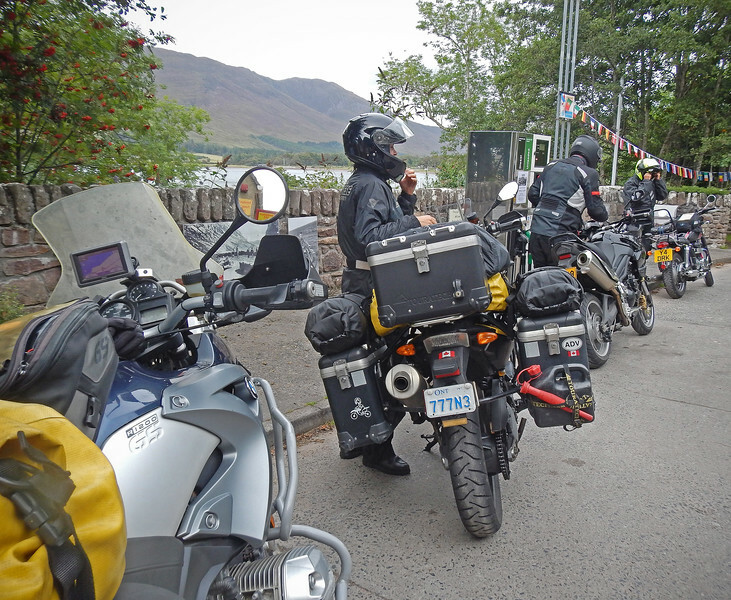 Being the moto-snobs that we are, we flee this scene and try to get out into the countryside before the tourbusers finish their lunch to join us on the road. In the distance, we see a distinctive set of stones rising up from the mountain. 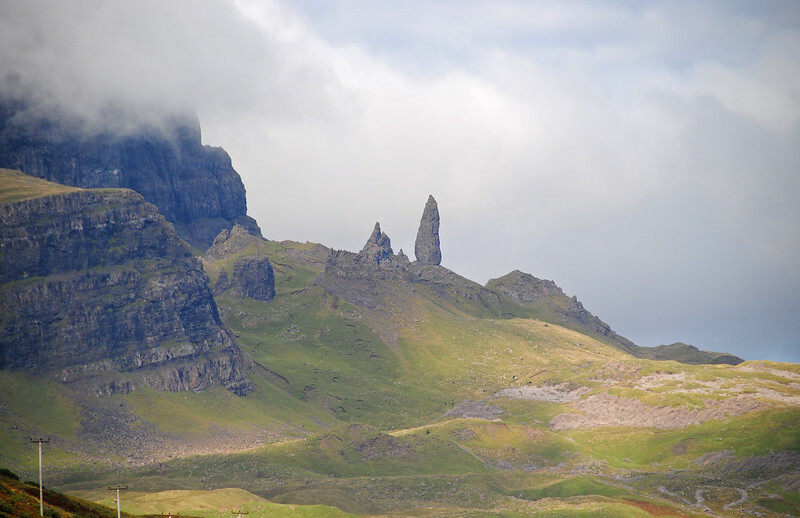 The locals call this "the Old Man of Storr"
This peninsula is called the Trotternish and the ridge along Mount Storr is very popular with hikers. 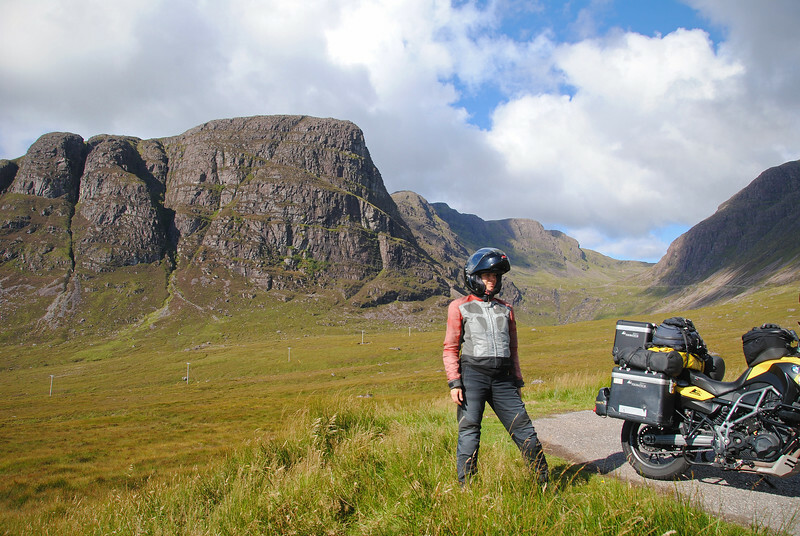 I can feel the pull of that long hike trying to yank Neda off her bike, but I manage to keep us on track and we motor on to the very northern coast of the peninsula. 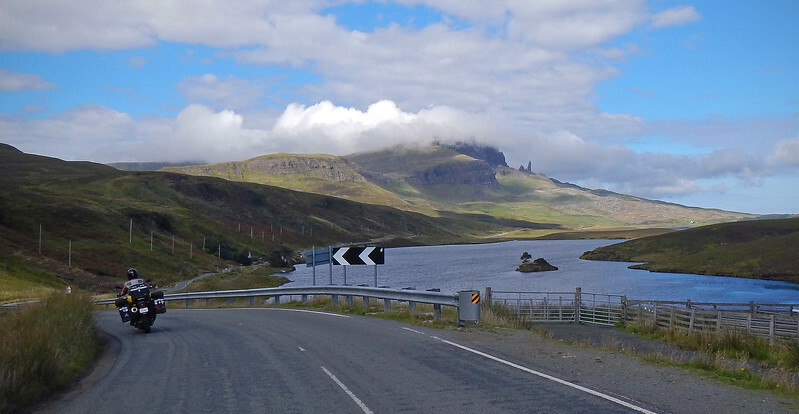 Most of the tourists seem to stay in the southern part of the Isle of Skye, where the larger towns are. Perfect. 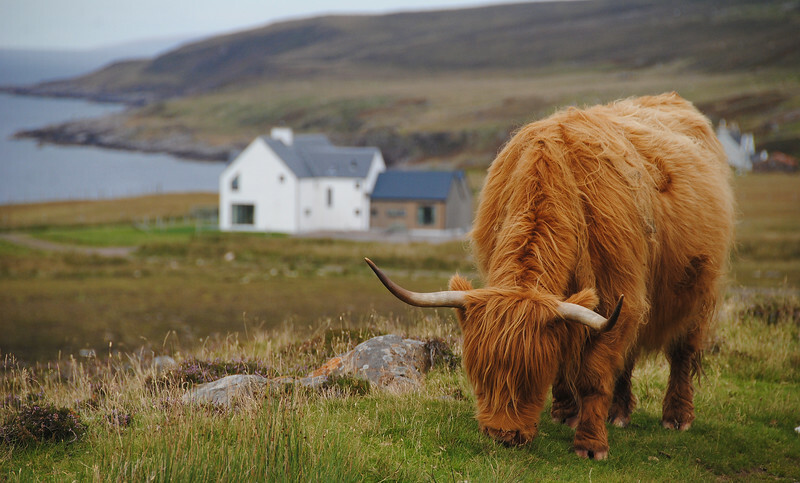 At Uig, the traffic becomes unbearable again. This prompts a quick change in our plans. 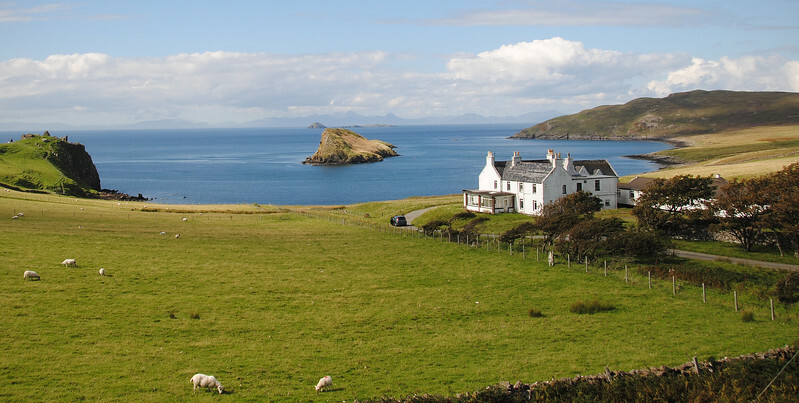 We're not going to stay any longer on the Isle of Skye - there's just too many people here. 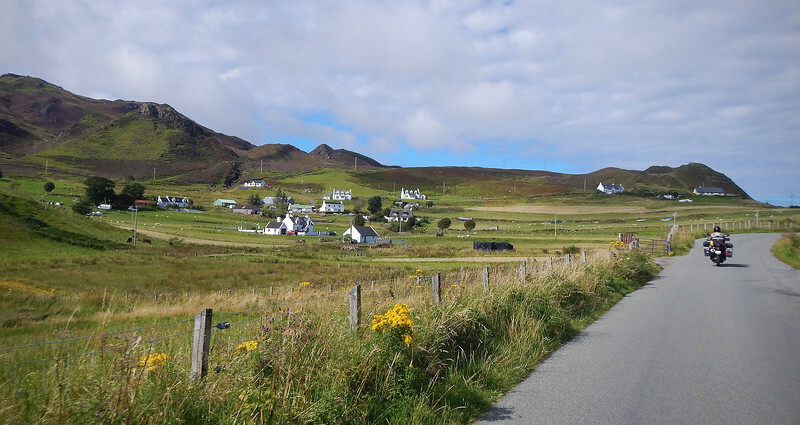 We originally wanted to head to the western part of the island, but instead we abandon our tour and head towards Armadale to catch the ferry to Maillaig, back on the mainland. And when we get there, we find out we had just missed the latest crossing and it'll be a two and a half hour wait. Ugh. Turn around and head back to the bridge... Boring ride. 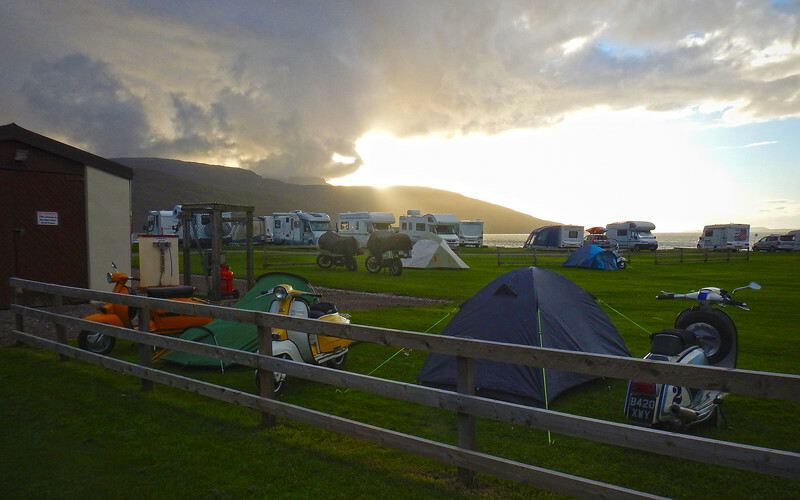 We end up at Fort William at the end of a very long day. 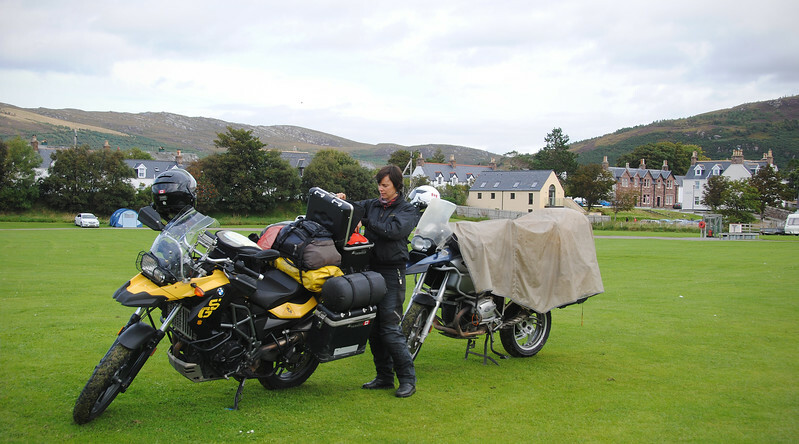 We manage to find a campsite just outside of town in Glen Nevis, at the foot of the mighty Ben Nevis mountain. Our tent site is right beside a very friendly group of travelers from all over Europe. Our campmates for the evening are Jan from Germany, another German girl traveling with her dog, Erik, the Texan who married a German girl and moved to Munich to be with her, and David a doctor from Exeter. We had a great time hanging out with all of them in the park, chatting animatedly until the sun was well below the horizon. We both really miss being in a large group and having that very social interaction. It's been so long since we had a large posse to joke and hang out with! A perfect way to end a long riding day! Our first 360 pic! 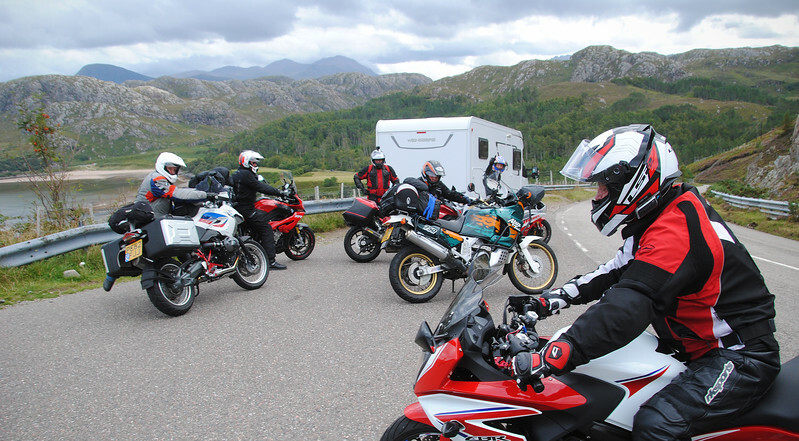 Use your mouse and drag the photo to see all around us and our bikes at Ben Nevis Park outside of Fort William! It's like you're right there! Cool! Thanks to Jan for the 360 pic.